Baron August Janssen, Brussels; his sale Frederik Muller, Amsterdam, 26 April 1927, p. 180, lot 114, (Dfl. 500). with Jacques Goudstikker, Amsterdam, 1927. W. Martin, Catalogue de la Collection de peintures du Baron Janssen à Bruxelles, Brussels, 1923, p. 180, no. 114, as Jan Steen. W. Martin, 'Neues über Jan Steen', in Zeitschrift für bildende Kunst, 1927-28, p. 330, no. 37, illustrated, as Jan Steen. C. Wright, Paintings in Dutch Museums. An Index of Oil Painitngs in Public Collections in The Netherlands by Artists born before 1870, London, 1980, p. 436, as Jan Steen. K. Braun, Alle tot nu toe bekende schilderijen van Jan Steen, Rotterdam, 1980, p. 90, no. 40, as Jan Steen. Old Master Paintings: An illustrated summary catalogue, Rijksdienst Beeldende Kunst (The Netherlandish Office for the Fine Arts), The Hague, 1992, p. 281, no. 2470, illustrated, as Jan Steen. Rotterdam, Rotterdamsche Kunstkring, Catalogue de la Collection Goudstikker d'Amsterdam, 11-26 June 1927, no. 65. Amsterdam, Jacques Goudstikker Gallery, Catalogue des Nouvelles Acquisitions de la Collection Goudstikker, October-November 1927, no. 120. The final word has not yet been heard on this charming oil sketch. It was accepted as an autograph work by Jan Steen by Karel Braun, however, not all Steen scholars are in agreemnent. The obvious similarities between this sketch and the finished work of the same composition, formerly in the Goudriaan Collection, Rotterdam, had already prompted Willem Martin in 1926 to propose that the former is a study for the latter, and Braun followed him in this assumption (see W. Martin op. cit., and K. Braun, op. cit.). 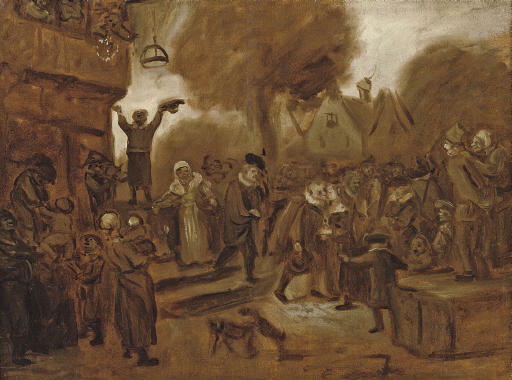 Another hypothesis, proposed by Wouter Kloek, to whom we are grateful (in a verbal communication, after inspection of the original), is that the oil sketch was part of Jan Steen's own collection of drawings and sketches. Kloek has argued elsewhere that Steen must have possessed a large collection of drawings that he used time and again as models for certain figures and groups that he would reuse in the same poses in a variety of compositions (see W. Kloek, Jan Steen (1626-1679), Zwolle, 2005). Hardly any drawings can be attributed to Steen with any confidence. Oil sketches on paper were not often employed by artists working in the northern Netherlands. Indeed it is only found in the oeuvres of Dirck Hals and his pupil, Anthonie Palamedesz., both, like Steen, specialists in genre painting (see P. Scatborn, Figuurstudies, The Hague, 1981, pp. 74-6). Another possibility is suggested by the technical analysis of Steen's paintings in the wake of the exhibition Jan Steen. Painter and Storyteller, held at the National Gallery of Art, Washington D.C., and the Rijksmuseum, Amsterdam in 1996-7 (see M. Bijl, 'The Artist's Working Method', in the exhibition catalogue, ed., G.M.C. Jansen, New Haven and London, 1996, pp. 83-91). X-ray examination of a number of works revealed Steen's characteristic style of underpainting, which corresponds very closely with the present work. This might support the possibility that this is not a separate sketch but instead a preliminary stage in the production of a painting that was either left unfinished or abandoned. This sketch once formed part of the collection of Baron August Janssen, an important Brussels-based connoisseur, who also owned the pair of works by Defrance Interiors of an Inn, which similarly passed through the hands of Jacques Goudstikker (sold Christie's, London, 5 July 2007, lot 18).